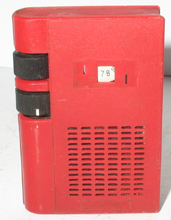 TOSHIBA BOOK STYLE AR800 transistor radio. Overall appearance is good. Red plastic, book style. 8 transistor. Japanese. Missing dial escutscheon. Not tested. Approximate size in inches 4.9H, 3.4W, 1D. Item #4248 PRICE REDUCED. More Pix. Pic 1, Pic 2, Pic 3, Pic 4, Pic 5.